A Scout leader asked me a week ago if I'd like to join him, his uncle and cousins on a three day, two might back-country fishing canoe trip for Fri-Sun. I was able to get Fri and Mon off work (Mon just in case). I met him at 0630 and we drove way up the Eastern Shore of Nova Scotia to the Liscomb River headwaters in Guysborough County. We her his uncle and cousins at 1000. They'd gone in the night before and in just over and hour, they'd each landed and released more than 10 speckled trout over 9". Just hearing that, I was impressed. We shuttled the vehicles and put in about 1200. This is an annual trip for them and they normally go a month earlier. The water was low and there was a lot of dragging over too shallow rapids, but we didn't have to portage around and of the bad rapids! When we got to the first good pool, we each landed a fish on the first cast, even me. They were all fly fishing but I only spin cast (and not well at that). Anyway, we camped on a pine point that night at the junction where a creek enters. Nice spot. One hammock, three small tents and my tarp. We cooked some injured trout on the fire, I showed them how to make a pot hook on a tripod using a withy and we enjoyed some uncommon beverages in moderation. Next day, I caught one with my first cast just after dawn. I'd been testing a tip repair and hooked a 10 incher. Unfortunately, he ripped his jaw during the fight. He was welcomed to join us for breakfast. That day, Sat, was a flat water paddle over a lake and through some stillwaters in an area called The Alder Grounds. We saw an endangered Nova Scotia mainland moose swim across the river 20m ahead of us. That was the trip highlight. I reported the sighting to DNR when I got home. They need stats on the very rare sightings. We stopped the next night on thenridge of a point that has a full on class III rapid even in this low water. We ate, chatted and were all to bed by 2130. 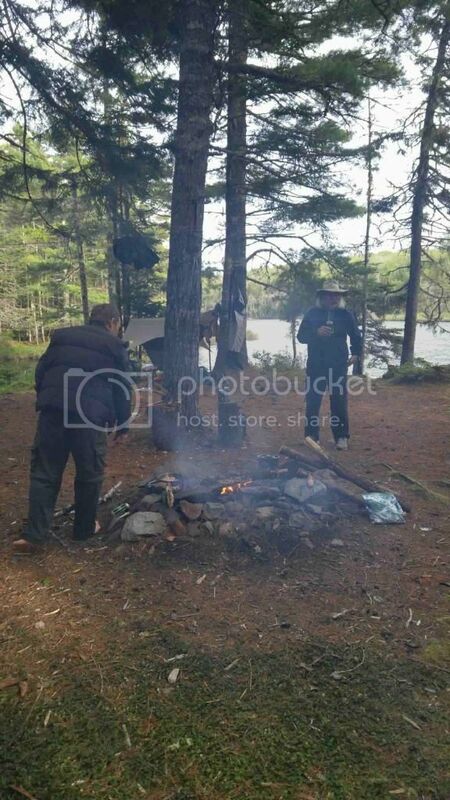 Next day, we finished the carry and canoed up to a camp spot for lunch near our take out. Three took off in the car to get the other two cars and two of us carried the gear and boats up to the road. It was an amazing time with some good guys, who each had some mad skills. It was the best fishing I've ever seen in my life and about as close to "The Tent Dwellers" experience as you can probably get. Looking forward to your pics. Sounds like a great trip even without pictures! That sounds like a great time & trip with friends......made even better with good fishing! Like Nuke, I'm looking forward to the pictures. This shows the low water. Normally in May, this is passable. Here's a good shot of the campsite and fire pit. Unfortunately, although it's not used often, it's been used for a very, very long time. We took out at least a bag of old garbage. Here is the setup I used. I expected some long portages so applied my ultralite methods to this trip. 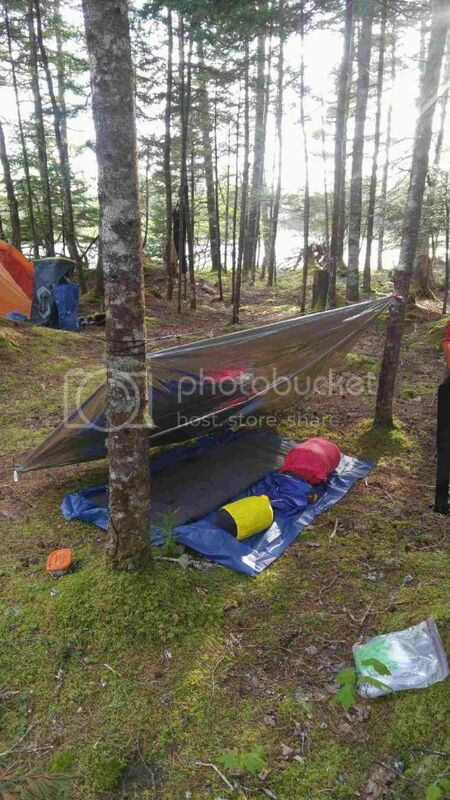 SOL emergency tarp, Dollar Store ground sheet, thermarest and +10C bag. The boys thought I was nuts and that the black flies would carry me off or strip me to the bone. Never had a complaint even on the second night when it rained. 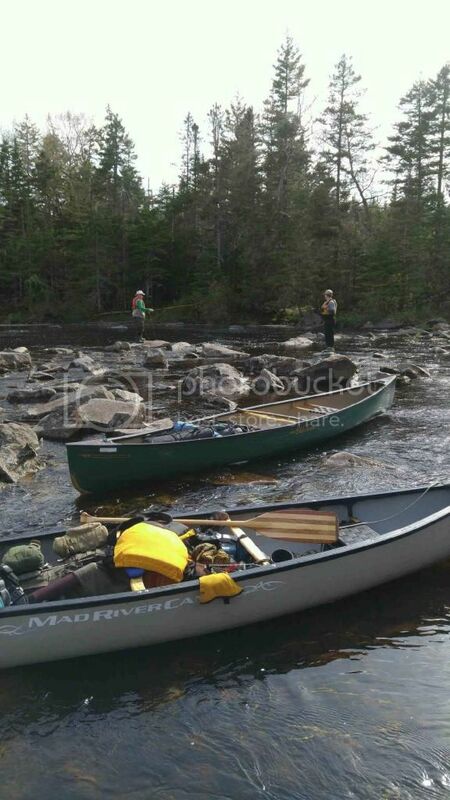 Shot of two of the the canoes in the foreground and two of the guys laying some flies in the back ground. Great report and pics! Thanks for taking us along. Thanks Sarge, but I can't take credit for the pics. My phone/camera was wrapped in four ziplocks in my pack. We all missed picks of the moose. 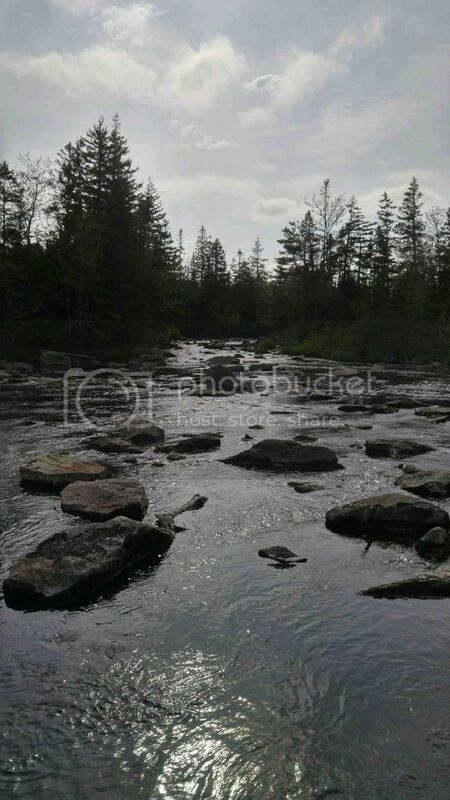 Were you paddling the Old Town or the Mad River......or did you get a chance to paddle both of them? I'm just wondering if you guys liked one over the other. I was in my buddy's Mad River. Solid and well made boat, but medium heavy, lighter than a pelican. It tracks very well and was a fast boat and although okay in the white water, we were heavy: my pal is a big dude. The Old Town is the same as one I've used before. Much lighter, better in white water,!very durable/repairable (the one pictured was all but destroyed last spring and with new gunwales and thwarts and seats it's good as new (ish). Not as fast on the flats. It would be my choice if I had $1,500 or so laying around. Here's a trip I really wish I could have been. That looks like a lot of fun. My brother makes canoes and has just gotten to the point where he was able to make one for himself. I've been dying to get out in the thing for a camping trip but he and his wife just had a kid so I'm stuck here waiting for him to get a free weekend. One of these days. Good trip and thanks for the report. Please share more, when ya have the chance! I'm planning a few more trips this summer with my lad and nephews. I'll post up what I can. I've missed the best of the canoe season on the rivers, but we'll get in a lot of lake canoeing (portages and all). As well, I'll be in Keji National Park (of The Tent Dwellers fame) with my Venturers (Scouts 14-17)!this weekend. We are volunteering with the Blanding Turtle nesting monitoring. We'll spend each night out on the beaches looking out for these endangered turtles, and then mark and cage each nest to prevent predation. Worthwhile, educational and in about the last virgin Acadian old forest. Can't wait.